This page provides the instructions for and examples of use of the various laminated label tapes available for purchase from SAILSetc. The "Hull pack" contains the rake and sheeting gauges, while the "Rig pack" contains the draft and twist gauges and the boom hole spacing template. The gauges are printed onto Brother TZ thermal 24 mm wide laminated tape. Production is currently "black on clear" for hull gauges, and "black on white" for rig gauges. (The examples shown here are printed black on white or red on clear. These are all "pre-production" sample illustrations.) For "black on clear" gauges, the background of whatever the tape is attached to will show through, and makes the result particularly attractive when set to a coloured deck, for example. There is a problem if the background is a dark colour, as would happen with a hull finished in natural carbon fibre, so the hull gauges are now available "white on clear" as a special order. All the gauges (with the exception of the rake and draft gauges) are designed for "right-handed" use. This does not mean that they are used or attached to the starboard side of the boat, or even that they are normally held in the right hand! A right-handed sailor would usually place their boat port-side down, and then work on the starboard side of the boat from behind using their right hand. In this case, the sheeting and twist gauges are actually held in the left hand and are positioned or used on the port side of the boat. The tape comes with four "mast indicators" at , and two gauges at . 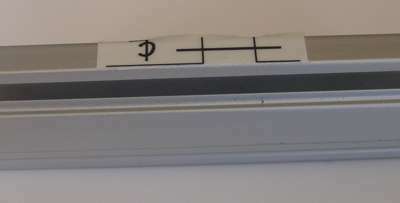 Each mast indicator can be peeled off separately, and attached. Note that the tape doesn't much like taking up a curve. Although it will appear to stick onto the mast just fine, when you return tomorrow the ends will have sprung off and separated from the mast. So once you have stuck your indicator to the mast, wrap a length of "sellotape" over it to keep it in place. There is one indicator for each of the No.1, No.2, and No.3 masts, plus a fourth to be used on a length of spare mast tube for calibration. Decide which side of the boat you generally work at, and chose the gauge, port or starboard, which suits. Attach it on the foredeck next to the mast. The gauge markings have a 2.6 mm pitch. These give rake readings in degrees, if you have a depth of 150 mm from where the gauge is set to the bottom of the mast step. If your hull has some other distance between the gauge and the mast step, well, the numbers will just provide arbitrary units rather than a reading in degrees. 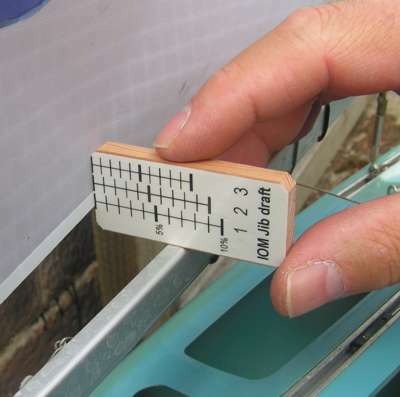 The picture shows a length of mast tube set at 0 degrees rake for calibration and temporarily held in place by some putty, the indicator strip set on the tube, and the gauge then positioned as required on the deck. The main sheeting angle tape provides two gauges. The top gauge at is intended for use on a probe, where it is held against the main sheeting post, and the sheeting angle read off according to the position of the boom. 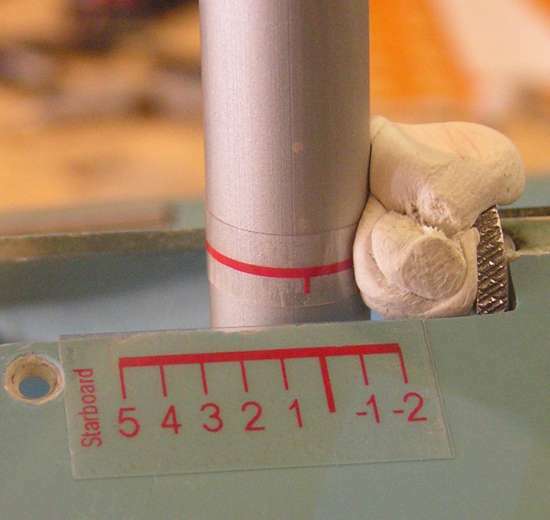 A trim line is provided for the case where the post is 8 mm in diameter, and it is angled at 5º to provide an average position of the probe. The bottom gauge at is intended for use on the aft deck of the hull, where it would be permanently attached next to the sheeting post. A trim circle is provided to accommodate a 8 mm post; adjust this to suit. 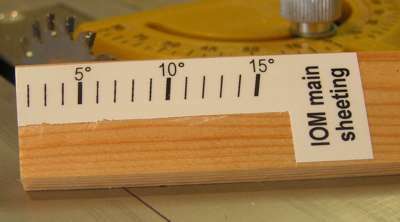 The picture illustrates the top gauge from the main sheeting tape set onto a probe, a length of pine 25 mm wide by 4 mm thick. The bottom gauge has been trimmed away to prevent any, ah, confusion on the part of this drowsy sailor. In either case, the same gauge is used for all rigs. The gauge markings read in degrees if the main boom sheeting radius is 195 mm or thereabouts to the location of the sheeting post. If your sheeting post involves a different sheeting radius, then these markings are arbitrary units. In the above example photo, the main sheeting gauge is reading a main boom sheeting angle of around 5 degrees. The jib sheeting angle tape is intended for use on a probe, where it is held against the mast and the sheeting angle read off from the end of the boom. Two trim lines at are provided for the two main mast diameters, angled at 12.5º as an approximation to the average jib sheeting angle. 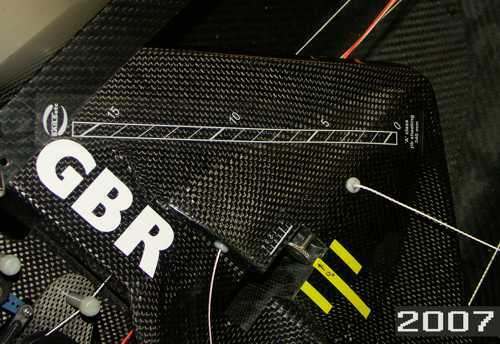 The tape provides three measurement gauges, one for each of the rigs, as at . The gauges read in degrees on the assumption that the jib boom pivot is located at 22.5% of the jib foot, giving sheeting radii of 295 mm, 270 mm, and 230 mm respectively to the end of the jib boom for each rig. The picture above shows the probe being trimmed to suit a 11.1 mm dia mast. Although it cannot be seen in this picture, the main sheeting gauge has already been attached to the reverse of the probe, so both sheeting gauges are on the one probe. 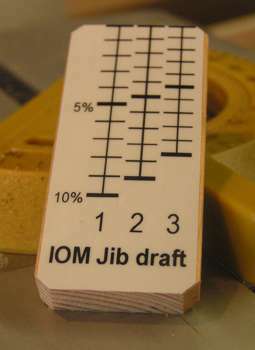 The jib sheeting gauge is reading a jib boom sheeting angle of around 16 degrees in the above example photo, given that this is the No.1 jib. The draft gauges are intended to be set on a probe, and are trimmed at either or . The probe is offered vertically to the mid-foot of the sail, and the draft reading taken at , either along the boom centre-line (if trimmed at ) or along the boom track edge (if trimmed along the alternative trim line at ). There are three boom centre-line indicators provided at , to suit the SAILSetc section boom. Peel them off separately and attach them half-way along the top surface of each boom if the gauges are trimmed at . The draft indicator is attached to the top of the boom, such that the reference line, arrowed, aligns with the edge of the boom track. The boom centre-line is then correctly located, offset 2.5 mm from the edge of the boom track. The "alternative trim line" provided at gives an offset to the gauge, allowing measurement to be taken to the boom edge rather than the possibly less clear boom centre line. The offset is 2.5 mm. The draft reading is a percentage of foot (chord) length, and is calibrated to the foot lengths of the IOM main and jib for each rig. 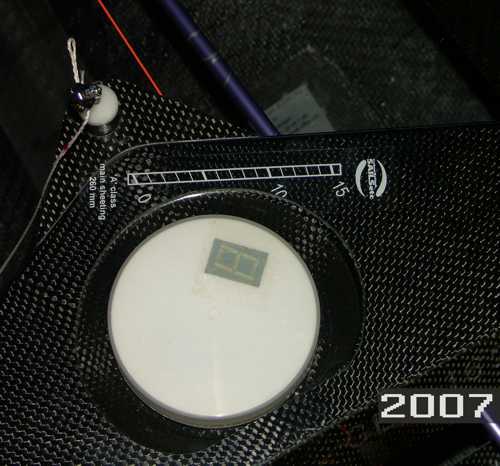 The two gauges can be attached to a single probe, one per side. The picture shows the probe for jib draft, trimmed at . Note the chamfered corners -- essential to avoid sail damage! The pitch of the measurement lines on the draft gauges are calibrated to the way the gauges are used. By pressing (very gently!) against the foot of the sail, the gauge makes the sail foot take up a triangular shape, rather than a free-flying aerofoil shape. This would normally cause the gauge to over-estimate the sail draft, as illustrated in the diagrams below. The value of h' (height of triangle) is larger than the value of h (height of aerofoil). Using a spreadsheet (Gauges/Draft.xls, 21 kb), however, the over-estimate can be approximately calculated and corrected. The gauges provided here incorporate the correction, and read "true" draft when the sail foot forms a shallow triangle during measurement. 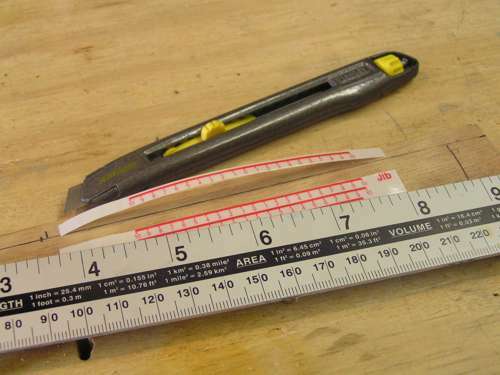 These two gauges are intended to be attached to a measuring stick, and do not need trimming at any particular point. For both gauges, the twist is measured from the aft end of the top or upper batten for IOM rigs. The main twist gauge is used by being set against the backstay at , and then sighting the end of top batten and reading its twist at . 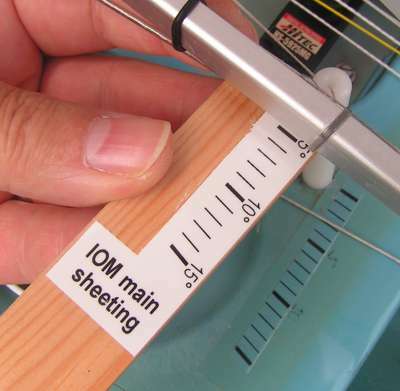 The gauge assumes that you have sheeted your main boom to 5 degrees, and allows for this by the gap between the backstay line and the start of the measurement lines. If your main is sheeted to some other angle, or you don't know the angle, then simply move your main boom to the boat centre-line (with your finger, not the winch! Using the winch will probably pull the boom down some and therefore give an inaccurate reading), and read the twist with the backstay set at 0 degrees for the appropriate rig. Similarly, the jib twist gauge is set against the topping lift at . Sight the end of the upper batten and read its twist at . 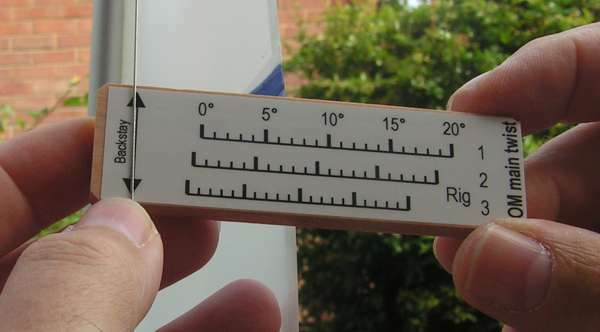 The jib twist gauge is reading a jib twist angle of around 12 or 13 degrees in the above example photo, measured at the upper batten for the No.1 jib. 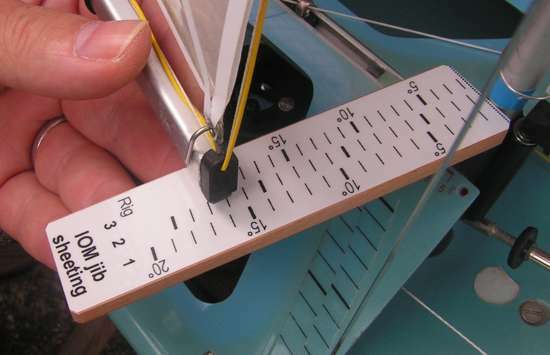 The main twist gauge is reading a main twist angle of around 6 or 7 degrees in the above example photo, measured at the top batten for the No.1 mainsail. The theory of the twist gauges is shown on the pages to do with Twist measurement and Twist measurement (part 2). Three gauges are provided at for each of three jib booms, and three at for each of three main booms. 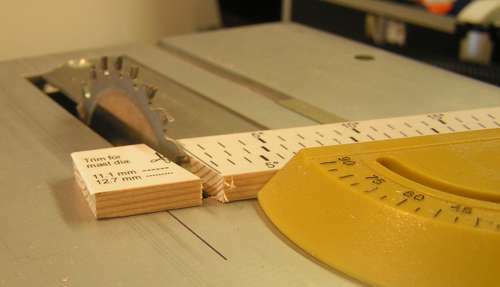 A gauge strip is cut from the tape, and stuck onto the boom. The photo below illustrates the sharp knife and steel straight-edge required for a clean cut. The markings identify where the sheeting adjustment holes should be drilled. If the gauge remains attached to the boom, it then serves as a useful scale for noting and remembering the settings. The hole spacing represents a one-degree change in sheeting. For the jib booms, this assumes a sheeting radius (distance between jib pivot and sheet attachment point) of 210 mm for each rig, and a resulting hole pitch of 3.67 mm. The hole spacing for the main booms assumes a sheeting radius of 195 mm, and a resulting hole pitch of 3.4 mm. 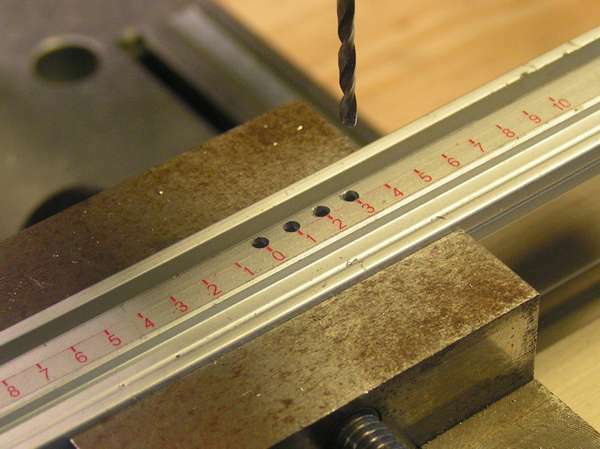 While a sharp drill bit will easily drill through the tape material, it will still leave a rough edge when withdrawn. The picture shows the tape trimmed sufficiently so that the holes can be drilled above it, allowing a clean result. Part of the main sheeting gauge has been trimmed away where it overlapped with the recess for the pot. Both gauges are positioned forward of the deck sheet fairleads, at the distance indicated on the gauge from the boom pivot point (260 mm for the main gauge from the 0 degrees position, 340 mm for the jib similarly), and are set at an angle, parallel to the edge of the nearest deck opening.